What started out as Canada 150 special outreach project in 2017 is now an ongoing program by the Aurora Sports Hall of Fame and its partners, the Aurora Museum & Archives and Sport Aurora. Starting this spring, many of those iconic moments – as submitted by the public and from the Hall archives – will be featured in ‘Mini’ Moments in Sport exhibits in various town locations: ACC, AFLC, Senior’s Centre, and Town Hall. To kick things off – appropriately during the NHL Playoffs – the Hall of Fame is featuring Aurora Sports Hall of Famer Hap Holmes, who is a Hockey Hall of Famer and the 1st goalie ever to win the Stanley Cup with four different teams. 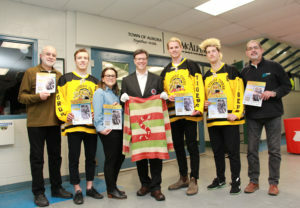 On Friday April 13th, Craig Campbell, Curator Hockey Hall of Fame, joined 2 members of the Aurora Tigers, ASHOF Board Member Bob McRoberts and Sport Aurora President Stephen Kimmerer (also ASHOF Board Member) and MIS Project Manager Karen Merk at the Aurora Community Center where the 1st of the Moments in Sport ‘Mini’ exhibits is featured. In addition to the physical exhibits, audio and video clips of the Moments will be available online. As well, the Hall will be featuring stories from the Moments in Sport campaign as part of the Hall of Fame expansion at the Stronach Aurora Recreation Complex (SARC) scheduled for this summer. The ASHOF is looking for more sport artifacts to be displayed with https://aurorashof.ca/moments-in-sport/ and is always happy to hear YOUR sport story! The Aurora Sports Hall of Fame was established in November 2013, by Sport Aurora and with the financial support of the Ontario Trillium Foundation. The Aurora Sports Hall of Fame (ASHOF) celebrates its 5th year, in celebration of sport history and excellence; dedicated to the recognition of the important place that sport has assumed within the fabric of Aurora. Every person who values the contribution of sport to our Community and Country is a part of that commemoration. For more information on Hap Holmes: please visit his Honoured Member profile here.